Christmas Eve Family Service: 4 p.m. The celebration of Christ’s birth on Christmas Eve, is such a magical night for all of us. Yet it can also be a hectic evening, as we juggle family traditions, rehearsals, gift giving, dinner, travel, and more. This year the family worship is early, at 4:00 pm. This change in time is to help families with young children attend worship and still have the kids fed and ready for bed in good time. We are hoping to lessen the stress on families by moving earlier. This year Pastor Jana will tell the story of Christ’s birth at an informal family service with the theme “Christmas ABCs.” Can you guess where to find the Z in Christmas? The children’s choir will sing, directed by Tom Shelton. 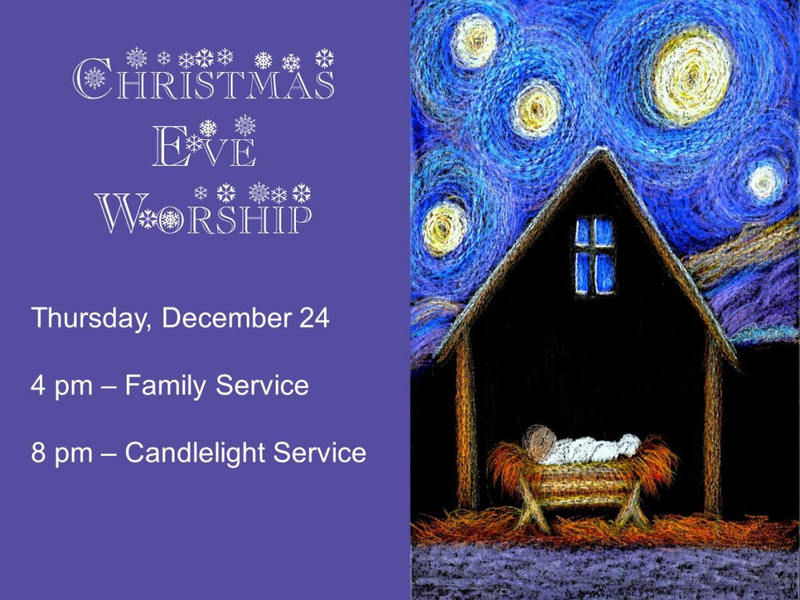 The 8:00 pm worship is a traditional Lessons, Carols and Candlelight service. We will hear once again the beautiful Christmas story told through song, scripture, prayer and soft candlelight. Hyosang Park directs the Chancel Choir, Bell Choir, and instrumentalists. If you are an alumni of the youth choir, you are invited to “sing-in. Meet at 7:15 p.m. in Room 203 with Tom Shelton. Bring your family and friends! This entry was posted in Children, Worship, Youth and tagged Bell Choir, Candlelight, Christmas Eve, Hyosang Park, Lessons and Carols, Rev. Jana Purkis-Brash, Tom Shelton. Bookmark the permalink.